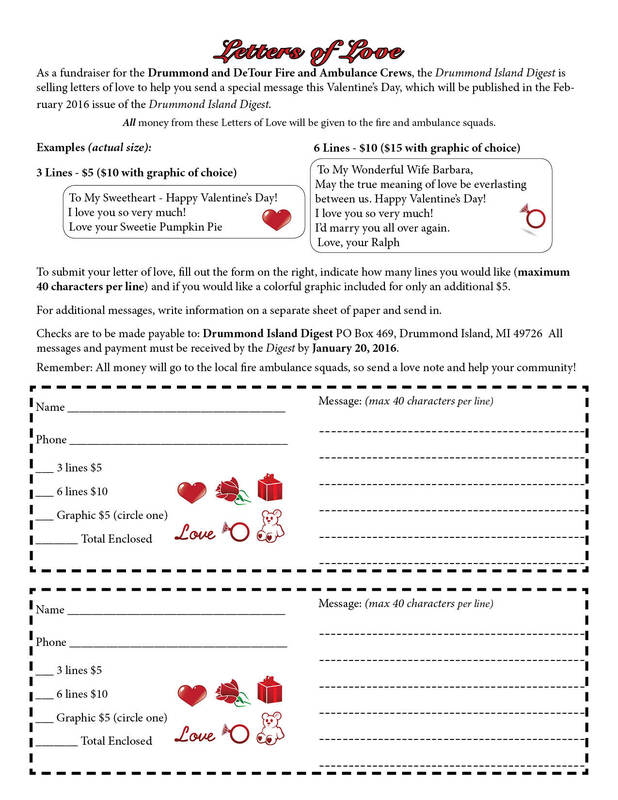 As a fundraiser for the Drummond and DeTour Fire and Ambulance Crews, the Drummond Island Digest is selling letters of love to help you send a special message this Valentine’s Day, which will be published in the February 2016 issue of the Drummond Island Digest. All money from these Letters of Love will be given to the fire and ambulance squads. To My Sweetheart – Happy Valentine’s Day! between us. Happy Valentine’s Day! To submit your letter of love, fill out the form on the below, indicate how many lines you would like (maximum 40 characters per line) and if you would like a colorful graphic included for only an additional $5. For additional messages, write information on a separate sheet of paper and send in. Checks are to be made payable to: Drummond Island Digest PO Box 469, Drummond Island, MI 49726 All messages and payment must be received by the Digest by January 20, 2016. Remember: All money will go to the local fire ambulance squads, so send a love note and help your community! Form for sending in a Letter of Love to appear in the February 2016 issue.